"How, in the contemporary period, can we evoke the imagery that communicates the most profound and most richly developed sense of experiencing life? These images must point past themselves to that ultimate truth which must be told: that life does not have any one absolutely fixed meaning. These images must point past all meanings given, beyond all definitions and relationships, to that really ineffable mystery that is just the existence, the being of ourselves and of our world." If we give that mystery an exact meaning we diminish the experience of its real depth. But when a poet carries the mind into a context of meanings and then pitches it past those, one knows that marvellous rapture that comes from going past all categories of definition. Here we sense the function of metaphor that allows us to make a journey we could not otherwise make, past all categories of definition." The corner of a room or the surface of a canvas is an open space and an invitation to creativity. It's a room to manoeuvre a collection of materials such as the contents of tubes of paint, a piece of stone or scraps of coloured paper. It's a space with situational potential, neither circumscribed by media nor by the display of a particular identity. Collage is an abstract system of representation and model of illusion with situational potential. The outcome is a complex mental expression of the human propensity to collect things and make pleasing arrangements of them. Making a collage exemplifies the poetic expression of taxophila more clearly than other forms of artistic activity. In particular, it is an incisive way of interfering in reality by wrenching objects out of the context in which they were created and transfiguring the collection in two-dimensions to create a self-referential whole with new meaning. In other words, these images point past themselves to the belief in an ultimate truth. An origin belief, also called a myth, is any story or explanation that describes the beginnings of humanity, earth, life, and the universe (cosmogony). Such beliefs can be derived from many different venues including scientific investigation, metaphysical speculation, or religious belief. To believe in something is not the same as knowing something. Intrinsic to the concept of belief is an implication that there is an opposite to belief, disbelief. Not everyone will believe something is true, but all sane and rational people will acknowledge an observable fact. It is a common error of human beings to allow belief, to allow a mental construct accepted on faith, to become so important, so obsessive, that it is taken as the same thing as fact. Indeed, there are many emotional reasons why a person might be driven to do this, but it still remains that any belief is purely mental whatever it's origin, and the mind can be mistaken. In order to be able to cope with life, we have to have facts to make decisions on. But mixed into these facts that we learn... and take on faith are real... are also many examples of nonsense and arbitrary belief, promoted as fact, by fanatical individuals. Fanatics are driven to promote their beliefs because of the conflict that occurs for them whenever their beliefs are challenged. To stop the feeling of conflict, the fanatic becomes compelled to convince everyone that their belief is fact, or, failing that, to destroy those who threaten the belief. When there are no facts to support a belief, the belief is provision. This essay describes the rationale of making collages, which express a European's view of belief in an ultimate truth using Eastern artistic representations of spiritual forms to assemble a poetic mindmap of human relationships with the cosmos. 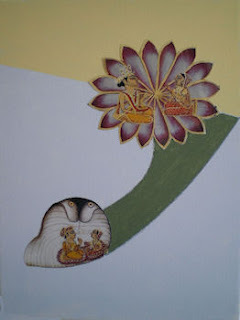 Human figures are taken from Hindu and Buddhist religious contexts and transfigured by combining them with other forms to add a breath of human nature to change meaning. 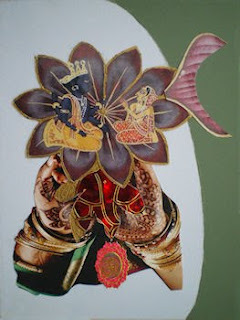 The collages are windows for viewers to reveal new beliefs by opening routes to understanding beyond present meanings. Cognitive researchers are increasingly turning their attention to understanding how our emotional being has evolved as both a primary and necessary part of our rational being. The importance and significance of the ways in which emotion and reason are both integrated in the aesthetic dimension of the arts may become more relevant to the perennial question, not only of what makes us human, but, being human, of what makes us what we are. To perceive freshly, with fresh senses is to be inspired. This is the route to create new myths. Campbell’s fundamental belief was that all spirituality is a search for the same basic, unknown force from which everything came, within which everything currently exists, and into which everything will return. This elemental force is ultimately “unknowable” because it has existed from a time before human animals evolved with their words and knowledge. So this basic driving force cannot be expressed accurately in words or pictures. It can only be referred to through spiritual rituals and stories which use metaphors couched in the various stories, deities, and objects of spirituality we see in the world. For example, the Genesis myth in the Bible is not a literal description of actual events, but rather a story with a poetic, metaphorical meaning. It should be examined for clues concerning the fundamental truths of the world and our existence. Therefore, poetry, myth and spirituality are all bound up together as transcendent bridges and pathways towards the fundamental truth of how the universe was created. A process of transfiguration is required to make new myths and their icons for bypassing organisational dead ends. Campbell expressed this process as "following your bliss." He derived this idea from the Upanishads of Hinduism to keep to a personal track in order to pitch yourself beyond current mythology. “Now, I came to this idea of bliss because in Sanskrit, which is the great spiritual language of the world, there are three terms that represent the brink, the jumping-off place to the ocean of transcendence: sat-chit-ananda. The word "Sat" means being. "Chit" means consciousness. "Ananda" means bliss or rapture. I thought, "I don't know whether my consciousness is proper consciousness or not; I don't know whether what I know of my being is my proper being or not; but I do know where my rapture is. So let me hang on to rapture, and that will bring me both my consciousness and my being." I think it worked”. “If you follow your bliss, you put yourself on a kind of track that has been there all the while, waiting for you, and the life that you ought to be living is the one you are living. Wherever you are—if you are following your bliss, you are enjoying that refreshment, that life within you, all the time”. Campbell was fascinated with what he viewed as basic, universal truths, expressed in different manifestations across different cultures. Accordingly, Campbell believed the religions of the world are various, culturally influenced “masks” of the same fundamental, transcendent truths. All religions, including Christianity and Buddhism, can bring one to an elevated awareness above and beyond a dualistic conception of reality, or idea of “pairs of opposites,” such as being and non-being, or right and wrong. 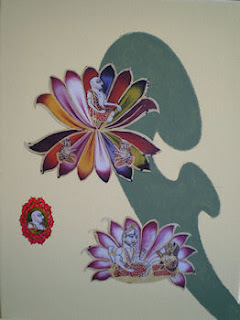 Indeed, he quotes in the preface of The Hero with a Thousand Faces; "Truth is one, the sages speak of it by many names. "—which is a translation of the Rig Vedic saying, "Ekam Sat Vipra Bahuda Vadanthi." In his four-volume series of books The Masks of God, he tried to summarize the main spiritual threads common throughout the world while examining their local manifestations. His idea was that many of the belief systems of the world which expressed these universal truths had a common geographic ancestry, starting off on the fertile grasslands of Europe in the Bronze Age and moving to the Levant and the "Fertile Crescent" of Mesopotamia and back to Europe and the Far East, where it was mixed with the newly emerging Indo-European Aryan culture. The aesthetic act of pasting objects and papers to a surface has been practiced in various folk arts for centuries, including twelfth-century Japanese text-collages decorated with paper foils, African tribal emblems, fifteenth-century Persian and Turkish cut-paper designs, German weather charms and lace valentine greetings, as well as eighteenth-century butterfly-wing collages. Collage as a fine art medium, however, emerged with the cubist pasting and gluing experiments of Georges Braque and Pablo Picasso in France in 1912. These various activities all involved transcribing and mapping of various objects across mental spaces to make a physical arrangement on a flat surface. This process is covered by blending theory. In Conceptual Blending theory, one works with mental spaces, which are schematic representations of knowledge and relationships i.e. an organizing frame or mindmap. So, the mental space of driving would contain knowledge about vehicles, their components, the functional relationships between human actions and resultant activity (steering, braking,...). One can take diverse mental spaces dealing with different subjects and "blend" them. For example, in the computer desktop you deal with folders, trash bin, files, and with activities like copy, move...etc. Here the source mental spaces are that of the regular office and the computer display. The blended output is the metaphorical organization of computer data in terms of concepts derived from the office. In general terms, one can incorporate any number of source mental spaces, link their functional counterparts, and derive a target blend. Creativity is said to result, when the blended space contains emergent structure (organization) not present in the source mental spaces. A prosaic spiritual example is the blending of a mass-produced Madonna hanging from the rear view mirror of a taxi with the interior of the mass-produced taxi to transfigure the vehicle’s space into a spiritual microcosm of passenger and driver. An aesthetic experience has been defined as "the vast, submerged continents of nonconscious thought and feeling that lie at the heart of our ability to make sense of our lives." One problem in applying blending theory to aesthetic experiences is identifying the principles that determine what gets selected for the various mappings across mental spaces to occur. One of the theory’s most significant achievements is the principled way in which it shows how new iconographic meaning can emerge from old information. Iconography refers to an intentional (not arbitrary) relation between the elements of the art medium and the mental images or ideas expressed through them. "...work that aspires, however humbly, to the condition of art should carry its justification in every line. And art itself may be defined as a single-minded attempt to render the highest kind of justice to the visible universe, by bringing to light the manifold truth underlying its every aspect. It is an attempt to find in its forms, in its colours, light, in its shadows, in the aspects of matter and in the facts of life, what of each is fundamental, what is enduring and essential-their one illuminating and convincing quality-the very truth of their existence....My task which I am trying to achieve is power of the written word, to make you hear, to make you feel-its is, before I make you see. That-and no more, and it is everything". What makes art special is not the cognitive processes that enable us to understand our world and our lives, but how they are exploited in order to put us in touch with the conditions of our emotional and sensuous experiences as participants in the world we share. No less than studies in the natural and the social sciences, analytical studies in the arts are crucial if we wish to understand and map the human cognition. The development of abstract art played a key role in this. This is language at the end of an era. His view was that art had become senseless and useless. The great Christian-humanist culture of the time before the Enlightenment had broken down. In the contemporary exhibition which Kandinsky describes we are moving amongst the ruins. The artist must express himself, the times in which he lives, and the 'eternal', what belongs to all times and to all cultures. This, the objective—what I have called the universal- has to be shown by means of the subjective. He was looking for a restoration of art through the abstract placement of line and colour, hoping to regain something that was lost in the nineteenth century, the universal, the deeper structure and law of reality. Art was given a high place in this quest to give form to a new life, a life of the spirit. We know that Kandinsky was highly influenced by the anthroposophy of Rudolf Steiner, a kind of westernised, 'demythologised', eastern way of religious thinking. So this generation of artists, at the beginning of the 20th century, was looking for a solution to the problem of regaining truth and reality. They were looking for absolutes, the principles that governed life and art and perception, the deep reality of human life, the truth of things behind their appearance. Art, in conformity with art theory in its long development from the Greeks through the Renaissance and romanticism, still had the task of revealing this 'eternal truth', i.e. that which is more than the eye can see. The work of art has to show deep human values, just as a mediaeval Madonna or, at a later date, a humanistic allegorical painting did. So we can understand Marc when he wrote in a famous article in Der blaue Reiter that the true artists were striving 'to create in their work symbols of their time that will belong on the altars of the coming spiritual religion, behind which the technical aspects will disappear'. This deep-felt reaction against the materialism of the nineteenth century which dissolved all reality, as it were, leaving man with his perceptions alone, searching for true prehuman absolutes and distrusting (or even disgusted with) reality, led to abstract art, an art that was truly and solely art, and at the same time spiritual, conceptual and 'absolute'. This commitment to abstraction lead ultimately to the art of Rothko. Rothko's vision of myth as a replenishing resource for an era of spiritual void had been set in motion by his reading of Carl Jung, T. S. Eliot, James Joyce and Thomas Mann, among others. He developed his philosophy of the tragic ideal into the realm of pure abstraction. He thereby opened up the possibility for mankind to transform a Christian cradle of mythic imagery into a new set of images, no longer dependent on tribal, archaic, and religious mythologies. Beverley Adams in her introductory essay to the concept of 'a poetic universe' used this notion to describe the activities of art collectors. The essay came from a view of the Diane and Bruce Halle collection of Latin American art that is neither chronological nor thematic. Inventive works by some of the most significant Latin American artists of the 20th century and those showing promise for the 21st century were presented in A Poetic Universe, which opened March 11, 2007 at the Museum of Fine Arts, Houston. Adams as curator of the Halle Collection, organised the exhibition, which featured nearly 60 works from 1945 to 2005 that incorporate such unusual media as cow bladder, ficus root, vinyl mattresses, and sea sponges. She claimed that collectors, like artists, have the potential to propose universes of their own, comprising diverse, often incongruent things. The collection itself becomes a work of art because the assembled objects are artistic arrangements of artefacts, each of which takes on a new poetic meaning in relation to its neighbours. The external logic of applying rigid categories is a personal superimposition. The artist's microcosm, and the universe of the collector's display, both consist of fragments of other's worlds. The collector's singular obsession is manifested through the assembly of different artists' works; sometimes, as is the case with the Halle Collection, the range of these works extends over an enormous expanse of time and space. The processes of an artist creating microcosms and a curator creating universes have much in common. Both combine the plodding of construction and the possibility of poetry because artefacts and collections both result from design and chance, ambition and accident. They interact with a logic that differs from the one imbued in the individual objects when they were first made. The act of collecting does not override the meanings built into the works. Instead, the new context provides another layer of meaning. Aesthetic evaluation of ‘little bangs’ enables us to determine the extent to which a given work of art successfully simulates the conditions of being iconic of reality. Aesthetics may thus be understood both in its philosophical sense of exploring the conditions of our sensuous and emotional experience and in its artistic sense of appreciating the nature of art in all its forms. 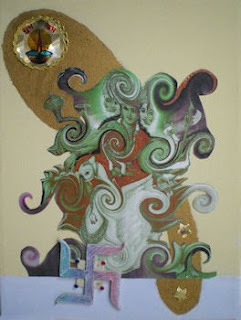 A major theme of the following set of collages is 'man made into god'. 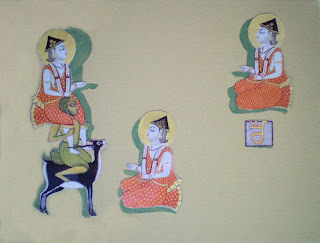 The first pictures took as a starting point the royal paintings of Jodhpur, which were included in the exhibition Garden and Cosmos at the British Museum in 2009. The major theme is the final set of seven paintings in the exhibition by 18th century court painter Bulaki. 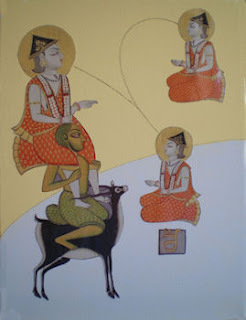 They depict a process of intense meditation whereby priests, described as mahasiddhas of the Nath sect, hover above a wavy field of colour representing the cosmic ocean, and pass through a series of sages to become gods. From the contemporary point of view, Hindu temples act as a safe haven where ordinary mortals can feel themselves free from the constant vagaries of everyday existence by dissolving the boundaries between man and divinity. 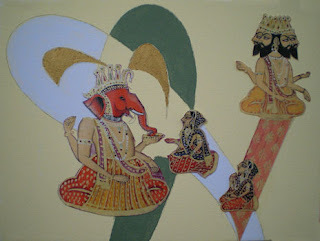 This is achieved by contemplating on a personal conception of the deity based on an individual cultural rooting. We have lost the divine who resided amongst us (Krta Yuga), which is the same as saying that once man was divine himself. Man lost the divinity within himself. His intuition, which is nothing but a state of primordial alertness, continues to strive towards the archetypal perfect state where there is no distinction between man and god (or woman and goddess). In this context it is interesting to observe that the word ‘temple,’ and ‘contemplate’ both share the same origin from the Roman word ‘templum,’ which means a sacred enclosure. Indeed, strictly speaking, where there is no contemplation, there is no temple. The Hindu Temple sets out to resolve this deficiency by putting into practice the belief that the temple, the human body, and the primeval sacred mountain and cave, represent aspects of the same divine cosmic symmetry. The three ways of obtaining release from an earthly life to become divine are the yoga of knowledge, the yoga of action and the yoga of devotion. 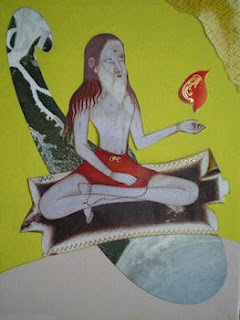 The yoga of knowledge involves intellectual and psychological techniques developed by Hindu holy men to control their actions and analyse their unconscious. They remove the obstructions to recovering the nature of their true selves. The true self is shown to be nothing other than Brahman, or God. The goal of all knowledge, therefore, is the experience of union with the divine. The yoga of action requires that duty be done with no thought for oneself or for the benefit or suffering that one experiences in fulfilling it. Through the performance of one's duty as a dedication to the supreme god, a kind of inner purification takes place, resulting in divine union. The yoga of devotion, the most common path, requires that prayers, the chanting of scripture and meditation on the image of god be undertaken with such intensity that inner obstructions are burned up and god is revealed within consciousness. All that is required is willingness to surrender oneself completely in devotion to god. 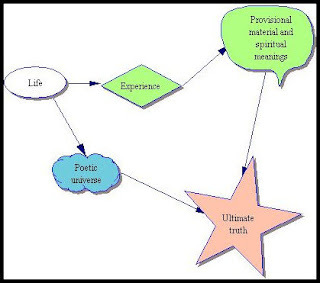 Regardless of which path is followed, the end is the same: the discovery of the true nature within oneself of a spiritual soul (atman) which is at one with god. 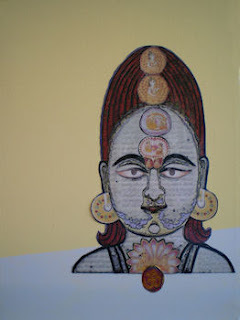 Another series of man-god collages focuses on depictions of the Buddha. For the first 600 or so years after his death, the Buddha and his teachings were represented in art by symbols such as the wheel, footprints, or empty thrones. The two main centres of Buddha creation have been identified as Gandhara in today's Punjab, in Pakistan, and the region of Mathura, in central northern India. One Buddhist statue from Mathura has been dated to 81 AD. A sculptured head of a Buddha from Afghanistan has been dated to the 1st or 2nd century. Gandharan Buddhist sculpture displays Greek artistic influence, and it has been suggested that the concept of the "man-god" was essentially inspired by Greek mythological culture. Artistically, the Gandharan School of sculpture is said to have contributed wavy hair, drapery covering shoulders, shoes and sandals, acanthus leaf decorations, etc. This iconic art was characterized from the start by a realistic idealism, combining realistic human features, proportions, attitudes and attributes, together with a sense of perfection and serenity reaching to the divine. This expression of the Buddha as a both a man and a god became the iconographic canon for subsequent Buddhist art. 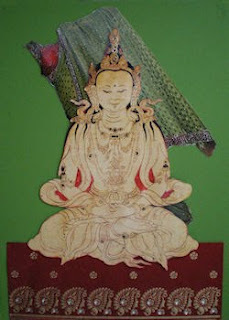 Buddhist art continued to develop in India for a few more centuries. The pink sandstone sculptures of Mathura evolved during the Gupta period (4th to 6th century) to reach a very high fineness of execution and delicacy in the modelling. 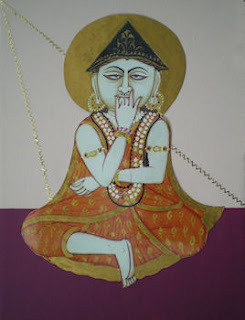 The art of the Gupta School was extremely influential almost everywhere in the rest of Asia. By the 10th century, creativity in Buddhist art was dying out in India, as Hinduism and Islam ultimately prevailed, but it went on to be developed in new and unique ways in China, Japan, Thailand, and other South and East Asian countries. Did a changing cultural context change the representation of Buddha? In the case of Christian mythology, we can ascribe the transformation of pictures of Mary the mother of god over many centuries to profound changes in Western culture. Madonna and Child depictions all stand for something supernatural, something above and beyond ordinary experience. In the thirteenth century they are posters telling people to go to Mary with their troubles. One can follow almost all the different stages in Mariology just by looking at the historical sequence of these paintings. For instance, in the fourteenth century one sees a new type emerge, the Madonna of Humility, where we see the Madonna sitting on a cushion on the ground, often offering her breast to the child. This is a marked change from the Madonna as Queen that we see in the earlier periods, and specifically in Romanesque times. Later, after the fourteenth century, the portrayal becomes more natural, with more attention to details like the hair, the chair, and the background that often becomes a landscape. And in the Baroque period she sits on clouds, high above us mortals, often accompanied by adoring saints. They are setting us an example, the painting tells us. So the important thing is that it is precisely the artistic qualities of the composition that pass on the message not just what we know or think about the Madonna ourselves. This is true for other Christian themes, such as a Crucifixion, an Adoration of the Magi, or a Resurrection. Always the artist was not concerned with historical events as such and not with archaeological accuracy, but with dogma, with a credal statement in a well-defined, traditional, compositional scheme. The styles might change as an outcome of the relentless effort of Western artists to depict material reality but the basic ideas remain. "In practical life... one will hardly find a person who, if he wants to travel to Berlin, gets off the train in Regensburg! In spiritual life, getting off the train in Regensburg is a rather usual thing. Sometimes even the engineer does not want to go any further, and all of the passengers get off in Regensburg. How many, who sought God, finally remained standing before a carved figure! How many, who sought art, became caught on a form which an artist had used for his own purposes, be it Giotto, Raphael, Durer, or Van Gogh!" The man-god collages are poetic transfigurations. They meet the modern criteria for a poem to be an autonomous object that may or may not represent the real world but is created in language made distinctive by its complex web of references. Postmodernists look on poems as collages of current idioms that are intriguing but self-contained — they employ, challenge and/or mock preconceptions, but refer to nothing beyond themselves. Any poetic universe, such as a picture collection or collage, has its own alphabet, its own geography, its stars and coordinates. A collection is a personal cosmos that might make sense or be whole only to the individual who built it, but is, in truth, never quite complete. From this point of view an artistic composition of materials and objects collected and pasted upon a surface, often with unifying lines and colour, may be described as a poetic microcosm, which gains significance when added to a collector’s universe. It is an assembly, composed of both borrowed and original material. The art of creating such microcosms produces works of art made from pieces of other things and arranged into a new whole. Constructing a poetic microcosm of things in the picture plane is a view of a collection of objects that are neither chronological nor thematic. The assembly of things to be attached to a canvas focuses instead on provisional and improvisational relationships that appear as the collection grows to a point where the artist feels the picture is complete. The affinities between a collage's visual, conceptual, ideological, and historical aspects, or those that are forced by proximity, provoke an ever-expanding web of associations. An exhibition of art may be visualised as a personal universe. It is a 'big bang' composed of numerous 'little bangs' of individual artistic creativity, each of which may be taken as an altarpiece for spiritual journeys we would otherwise not undertake.